Hi, everyone. My name is Susan Laine. I’m a Finn but I write in English. Today is release day of my paranormal gay romance, Stealing Dragon’s Heart. This is the sixth in the Lifting the Veil series but it is completely a standalone, so you don’t need to have read the previous books. You can find the story from Dreamspinner Press, Amazon, Barnes & Noble, All Romance eBooks, and other retailers. Notorious master thief Finn Grayson is hired to break into a high-class skyscraper in New Shanghai and steal a priceless artifact known as the Shard. But someone’s gotten to the Shard first—and the penthouse suite turns out to be a dragon’s lair. Cameron Feilong, Guardian of the Earth Shard, is ancient enough to realize that he and his unbidden guest are being used like puppets on a string. Forming a shaky alliance is the only way for them to survive and to stop their ruthless foes. Today I’m here to talk a bit about the behind the scenes, and to do a giveaway of one (1) e-book. My mother introduced me to ancient Chinese culture, art, and literature when I was a child. Ancient China felt like a mythical land, far removed from contemporary Finland. I’ve wanted to write a story based on what I’d learned for a long time. The setting is an alternate contemporary Earth, and about a decade after the mysterious Veil lifted, reshaping our reality. Our boring human world and the magical realm of myths, legends, and folklore ended on a collision course, irrevocably changing our planet. What’s so special about Stealing Dragon’s Heart then? The answer: Dragons! Specifically Chinese dragons that are depicted as wise, good, and honorable. I may wish to be a werewolf myself if I could, but of all the mythical, paranormal, and supernatural creatures I most wanted to meet a Chinese dragon. Their effect on Chinese mythology is substantial, and they appear far more complex than their monstrous counterparts in Western myths. The Chinese dragons are typically shown as snake-like creatures that move on four legs, and they have characteristics of turtles, fish, serpents, and the like. These beings represent positive powers, and they control rain, floods, typhoons, tsunami, and other water-related phenomena. Dragon was an imperial symbol of power, strength, and good fortune. I mostly kept that image with my dragon. Cameron Feilong is an immortal dragon. But his powers connect with the element of Earth, not Water. His sacred duty is to guard the Earth Shard. He is wise and powerful, and he is a sign of good luck for his human and flawed anti-hero, Finn Grayson, a thief who ends up in the lair of the dragon but manages to get through unscathed. Mostly, anyway. As you can see, Huángshān, or the Yellow Mountains, and their scenery were common subjects of artwork and poetry an ancient China, and even today through photography and film. During the Tang Dynasty (618-907 CE), tens of thousands of poems were written about Huángshān alone, and a school of painting was named after the region. 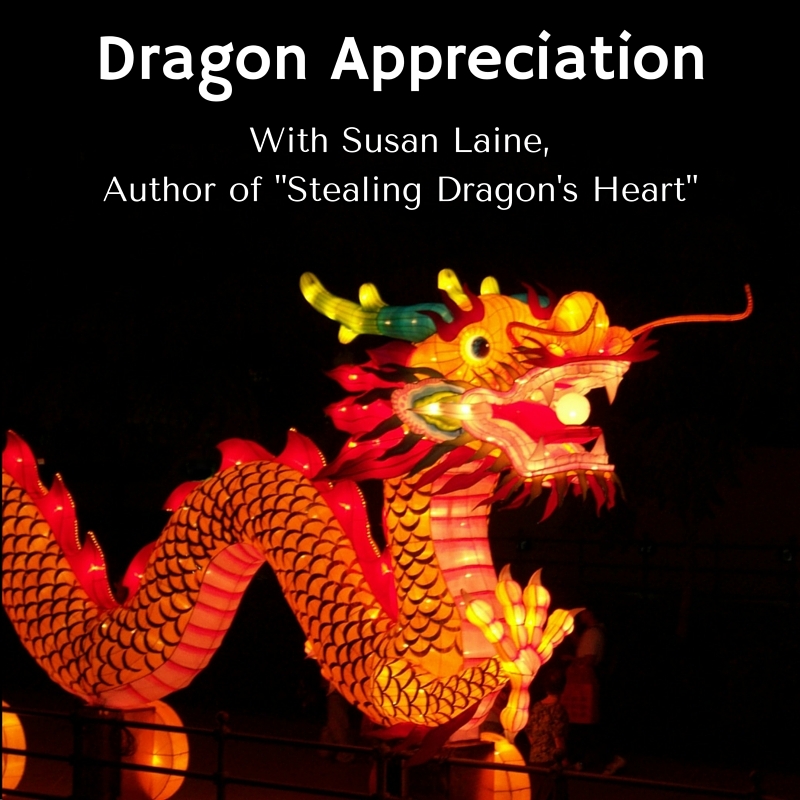 The cover of Stealing Dragon’s Heart, which depicts the Wǔ Xíng painting style, was done by the extremely talented Anne Cain. Cameron Feilong, my ancient dragon, shares my love of Wǔ Xíng artwork and poetry, and he even lives high in the Yellow Mountains. I adore ancient Chinese poetry, and the multitude of interpretations. In the story Cameron talks about his favorite poems and poets, among them Dù Fǔ and Li Bai, two essential poets of the Tang period. Below is an English translation of one of Li Bai’s poems, Long Yearning. To be in Chang’an [capital city of the Tang Dynasty]. Frost coalesces on my bamboo mat, changing its color with cold. I roll back the hanging, gaze at the moon, and long sigh in vain. A beautiful person’s like a flower beyond the edge of the clouds. Below is the green water billowing on. The spirit I dream can’t get through, the mountain pass is hard. As you can see, there’s a connection between literature, painting style, and nature. The aesthetics of these three always pleased me as a child, and now as an adult, ancient China inspired me to write a story about a wise dragon and his perilous adventure with a human thief. So there you have it. My thoughts on Stealing Dragon’s Heart. I hope you liked reading my sort of intro into the story and the ancient Chinese culture. I’m doing a giveaway of an e-book (Stealing Dragon’s Heart, or anything from my backlog), so if you’d like to enter, comment below with an answer to this question: “If you could be any mythical or paranormal being, which one would it be, and why?” Good luck, everyone! Thank you, DSP Blog, for hosting my guest post, and thank you readers for stopping by! As much as I too love dragons, I would be Pegasus. I think horses are amazingly beautiful and flying is my desired superpower, so Pegasus! Michelle, I hear ya! So many amazing beings with awesome powers and sweet looks. Deciding is so hard!